TOKYO, JAPAN 1973: Kentucky Fried Chicken (KFC) with colonel sanders life sized statue. Eight girls cheerleaders dance during KFC championship on mini-football. People taking food inside KFC chicken restaurant with 4k resolution. KFC in China. Located in Longhua, Shenzhen, Mainland China, February 2019. 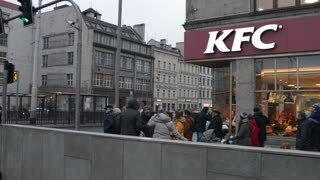 Motion of people going to order food inside KFC chicken restaurant with 4k resolution. CHIANG RAI, THAILAND - AUG 3: unidentified people standing at Kentucky Fried Chicken (KFC) Store Front on August 3, 2018 in Chiang rai, Thailand. CHIANG RAI, THAILAND - AUG 3: unidentified people waiting for ordering food at a KFC restaurant front on August 3, 2018 in Chiang rai, Thailand.